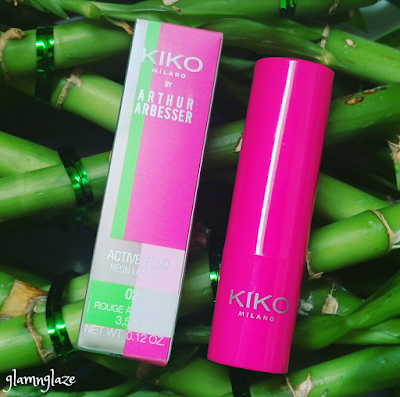 Recently, Kiko Milano(Italy) had launched their Active Fluo Capsule collection designed by the famous fashion designer Arthur Arbesser.The Active Fluo collection is all about neon shades and hence the name.There are three lipsticks in this collection apart from other products.I picked the shade 02,Powerful Fuchsia out of the three shades available.I love wearing bright lipsticks during hot summers and that's why I picked this one. Let's get started with the review! Matte lipstick that becomes fluorescent when exposed to UV light.The velvety matte lipstick feels wonderful and has staying power. The lips are enveloped in bold colour.The product glides on effortlessly and immediately adheres to the lips.Available in three colours. The lipsticks come in colours which can be matched with the collection’s lip pencils. All eyes are on the lips, enhanced by the rich colour and sophisticated matte finish. The lipstick becomes fluorescent when exposed to UV light. Apply the lipstick directly to the lips: start from the center and move towards the corners of the mouth.Always close well after use. PHENYL TRIMETHICONE, BIS(GLYCIDOXYPHENYL)PROPANE/BISAMINOMETHYLNORBORNANE COPOLYMER, HYDROGENATED POLYISOBUTENE, OZOKERITE, POLYETHYLENE, DIMETHICONOL BEHENATE, TRIACONTANYL PVP, SILICA, POLYBUTENE, TALC, VP/HEXADECENE COPOLYMER, CERA MICROCRISTALLINA (MICROCRYSTALLINE WAX/CIRE MICROCRISTALLINE), VINYL DIMETHICONE/METHICONE SILSESQUIOXANE CROSSPOLYMER, ETHYLENE/PROPYLENE/STYRENE COPOLYMER, FLUORESCENT BRIGHTENER 230, BUTYLENE/ETHYLENE/STYRENE COPOLYMER, ALUMINUM HYDROXIDE, BHT. +/-(MAY CONTAIN): CI 15850 (RED 6 LAKE), CI 42090 (BLUE 1 LAKE), CI 45380 (RED 22 LAKE), CI 45410 (RED 28 LAKE), CI 77891 (TITANIUM DIOXIDE). Oh my God! 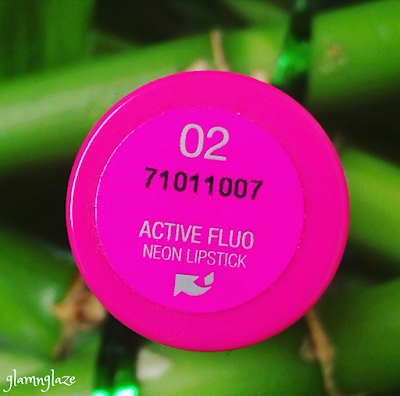 I got attracted to this lipstick mainly because of it's packaging.The outer packaging is so cool,It's made up of translucent material on which all the details like product-ingredients,quantity,shelf-life are mentioned clearly.I love the neon pink and green strips all across the outer packaging.Lovely! 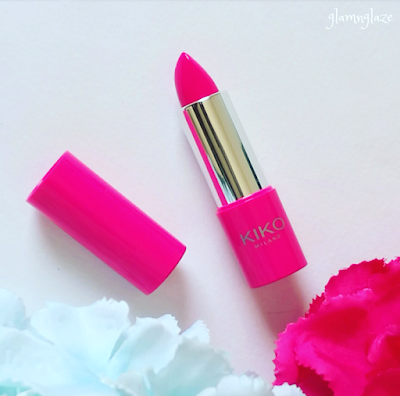 The lipstick comes in a pink coloured plastic tube.The tube has a twist open lid which is of pink colour as well.The packaging is very chic and modern.Also,it's sleek,sturdy and travel-friendly.The shade number is mentioned at the bottom of the lipstick. Very comfortable on the lips.Comfortable velvet-matte lipstick. Not transfer-proof.Transfers to the cutlery to some extent,not crazily. Doesn't bleed or feather from the lips. Very mild sweet floral scent that's really not overwhelming. It stayed on the lips for close to four hours.I am impressed.It survived light snacks and later on faded evenly from the lips.It stained the lips. 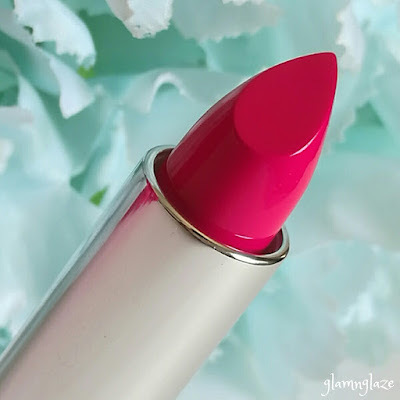 Doesn't survive heavy meal(s) at all like any other normal bullet lipstick.It goes off completely from the center of the lips.Re-application of the lipstick is easy, it glides on smoothly and sets to a velvet-matte finish. Note to people with dry and dehydrated lips:The only downside of this lipstick is that it dries out the lips to some extent as the time passes.This enhances the dry-lip-patches on the lips(if any).Also,it enhances fine lip-lines. Overall,I like this lipstick.Love it's buttery-soft texture.Exfoliate your lips well in advance prior to applying this lipstick.This will ensure a smooth application and as the lipstick dries and settles down,it will not enhance any dry patches on the lips as the time passes.Also,you can apply a lip balm underneath for keeping the lips moisturized throughout the day. Having said that,I would say that you should check out the #ActiveFluo collection and specially this lipstick.This shade is to die for.The lipstick is non-comedogenic ,it means that it won't cause any skin-irritations/ pore-blockage etc. highly recommend this shade if you love using bright lipsticks during summers. Now, available in India.Do check your nearest KIKO store. In UAE, official KIKO stores. Have you tried this lipstick? Have you checked out the Active Fluo collection? Do share your thoughts.